Venting is always important. It helps get rid of deep emotions before they hurt you. They also help you stay cool when it is hot outside. In ground trampolines need good ventilation as well. Air is one of the major forces in making a trampoline work. When you are installing an in ground trampoline, you need to make sure that you pay special attention to the ventilation system. The reason for this is that air helps the trampoline bounce correctly. The air is pushed out when you land on a trampoline. The lack of air helps you land softer. But if the air has no place to go, then your landing is a lot harder. This makes the trampoline tougher on your joints and back. The best way to let air underneath the trampoline is to live a large gap between the ground and the trampoline surface. This gap can be anywhere form 5 to 7 inches in size. The major issue that comes with using this method is that the gap may cause people to trip as they get on or off the trampoline. You should consider using a trampoline pad that allows for ventilation, or a safety net or some other mesh material to stop tripping and keep feet and legs out of the hole. This options help keep your pets from crawling into the hole and getting trapped. There are basically on two real ways to vent an in ground trampoline. The main way, as described above, is to leave a large gap between the ground and your trampoline surface. 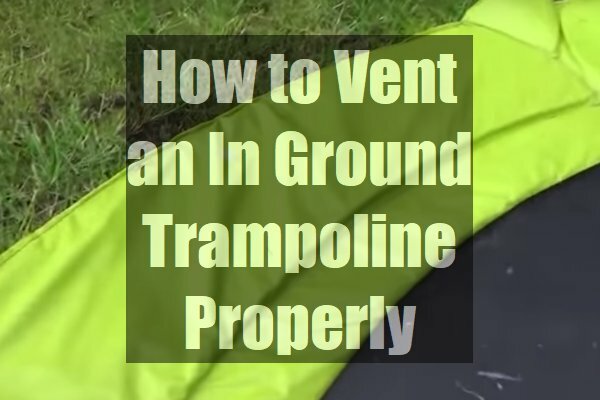 This is the easiest way to get the right amount of air flow underneath your trampoline. It is also the easiest way to make sure your trampoline bounces just right. The other option available is to use pipes. The type of pipe you use is up to you and some people recommend perforated piping. The problem with this system is that you need to make adjustments to your retaining wall and you will have to do extra digging. It may affect your drainage system as well. The main drawback to using pipe is that debris and dirt can get inside and clog up the venting pipes. You would need to add a mesh net to the end of the pipe to keep some of the debris out, It won’t totally solve your clogging problem but it will help. Of course, using pipe will add to your already high cost and you may not want to take that route. The diameter of the pipe should be about 4” in size. This should allow for enough room for the air to exit and re-enter. To get the most out of your in ground trampoline, you need to make sure the mat bounces like it is designed to do. If you let the air remain trapped inside, then your trampoline’s mat cannot get the force it needs to bounce the way it should. The way to solve this issue is to make sure you have the right venting. How you vent is up to you and your budget. We like the gap method not only because it is cheaper, but because it allows you to install good safety p[ads. These safety pads make sure you and your family are protected and makes sure the air get sin and out quickly. They also help your yard look better and provide a safety barrier to keep curious pets out of your hole.